We had Christmas #4 with our good friends the Grays this weekend. 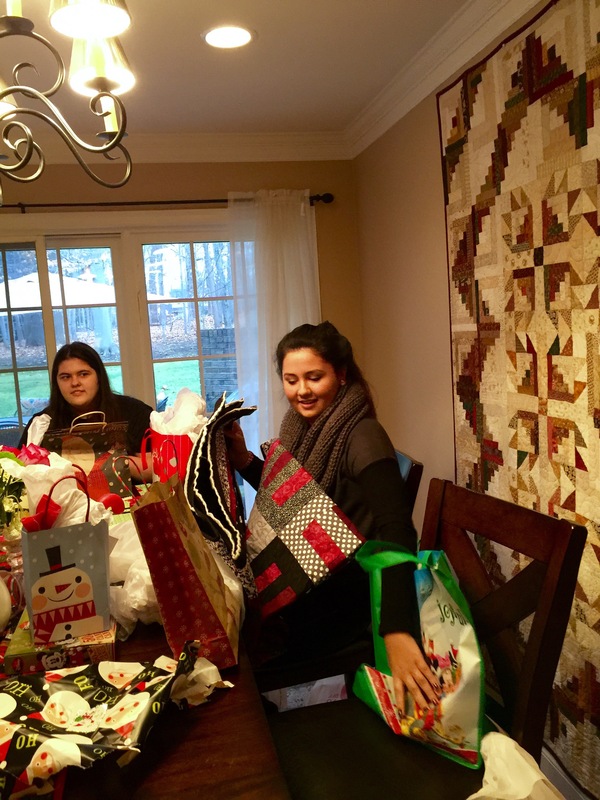 Before presents and our random-collection-of-appetizers-dinner we spent a bit of time in the sewing room. 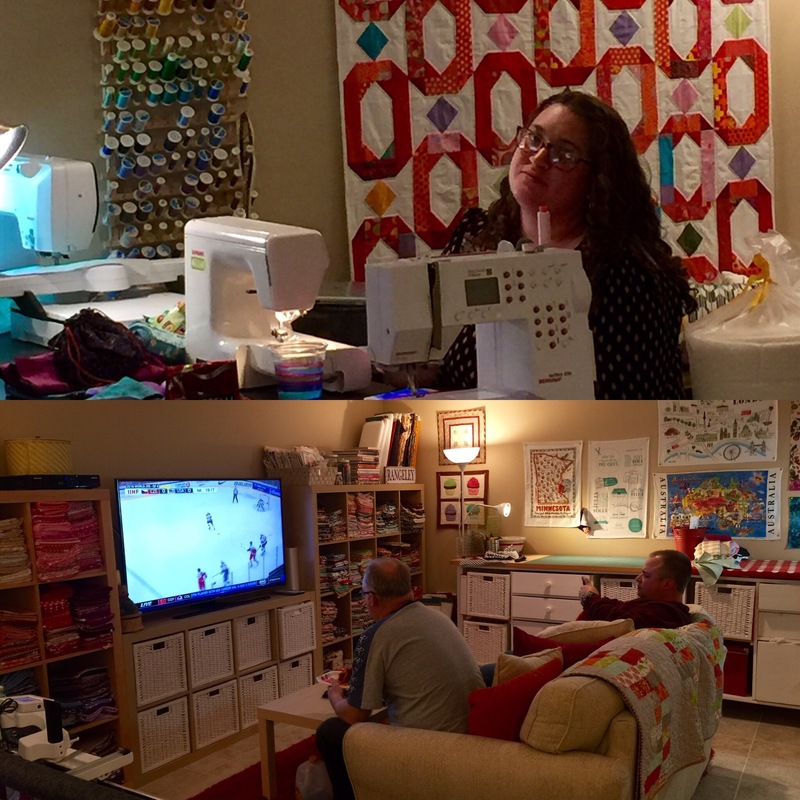 Jen worked on a beautiful batik quilt and started a new baby quilt, the guys watched hockey, and I raced to the finish line on my final handmade gift of 2015 – a new quilt for Kira. 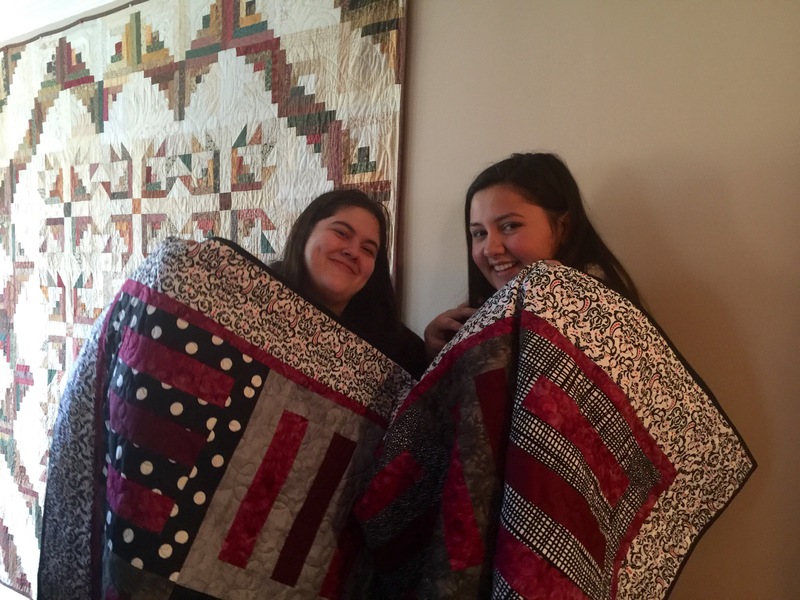 I last gave Maddie’s BFF a quilt around 2009-ish so I thought it was time for a new one. I actually had one cut out but then asked her mom what her color palette was these days. Suffice it to say that the brights I had started weren’t going to work with Kira’s palette of black, white, grey and maroon. This is Kira’s quilt. It is intended to be a large throw that she can use on her bed, but not too big that she can’t drag it around her house or bring it in the car. It is 55″ x 70″. Don’t let the pattern fool you. 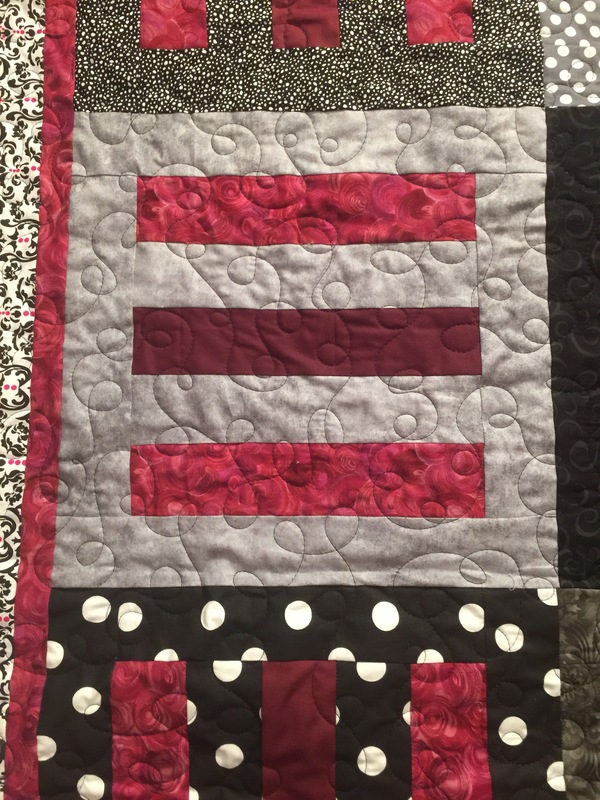 While this quilt would go together very quickly with a jelly roll, I mostly used fat quarters and yardage from my stash. 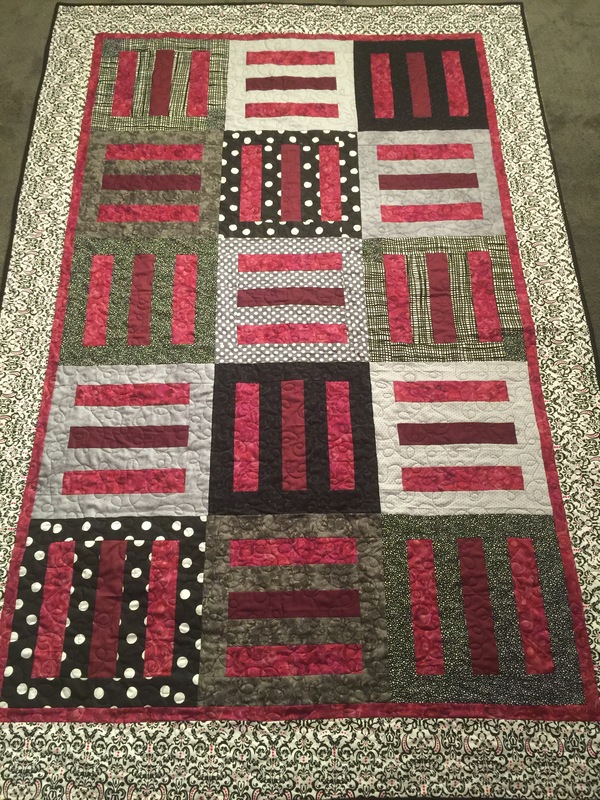 The quilting is a simple freehand loopy pattern in black thread. Jen was a great pal as always and made the binding for me. As you can see, when Kira opened it, the binding was attached to the front but not sewn on the back. 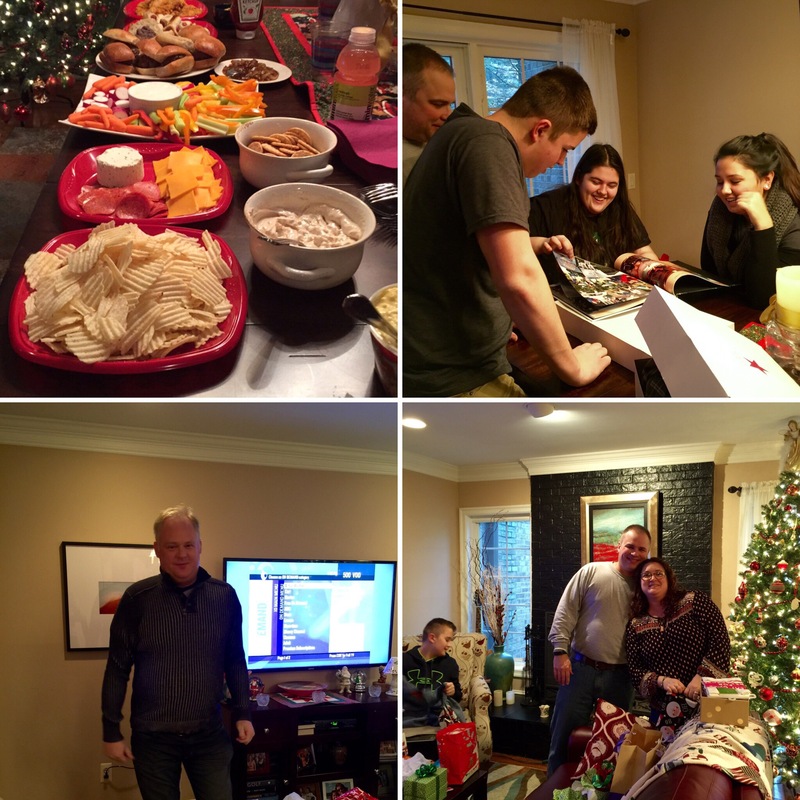 We had a great time with our good friends, and now Christmas 2015 is officially a wrap. I am so grateful for the fun, friends and generous gifts and have great memories of this holiday to carry forward. I also realize that I have to be more organized this year about making handmade gifts all year as I had a lot of ideas I didn’t get done this year. But I am happy with the projects I did finish! Next personal project is a bed quilt for Miss Maddie! Happy New Year!!! It is beautiful………..but I am convinced you never sleep!!!!! I am inspired!